Every property owner dreads the winter months, not because of the chill and icy cold winds it brings, but because of the damage the snow and ice causes to the outdoor areas of their property. Not only is the landscaping affected by this inclement weather, but features such as the driveways, patios, decks and roofing get impacted too. If the snow and ice is allowed to linger and eventually melt in these areas, that can result in significant damage to these installations, which can be expensive to fix. There are certain times during the winter season that Milan and its surrounding areas can experience very heavy rainfall. The buildup of ice and snow on your roof can impact its load capacity; this is particularly true in the case of older roofing structures or ones with lower pitches or flat surfaces. The snowmelt can seep into existing crevices in the roof and ice dams can also be extremely destructive to the structure. This kind of water damage can affect not only the roof feature but the fasteners, shingles and the undersides of the eaves and the attic spaces as well. We handle roof snow moving on residential, commercial and industrial properties. The work will be carried out meticulously, efficiently and safely ensuring that the roof and adjacent features don’t come to any harm. We also take great care in locating roof or dryer vents and skylights before starting the work. 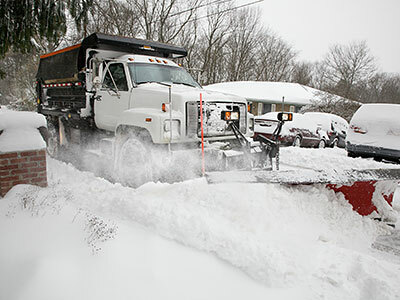 If your driveway is covered with snow and you want it removed efficiently, safely and professionally, simply give us a call and we will send our snow removal experts over to your property. They will survey all the elements and remove snow from pavers using shovels that have plastic blades. They will ensure no damage is caused to the pavers or driveway surface or even to the curbing and edging. Patios and decks can withstand more snow and ice weight than roofing structures. But its never a good idea to allow these to accumulate above a couple of feet. Leaving the snow there can affect the best of hardwoods and materials such as metal, composite and vinyl can become impacted as well. We provide excellent patio and deck snow moving services. We never use any metal shovels or any other hard tools as that only impact the surface of wood or composite decking materials. We may use snow blowers in the work but never use salt and other de-icing materials or chemicals as these can ruin the patio or decking floor surfaces.